But yes, I made that cake! I doctored up a box mix, using melted butter instead of oil, and milk instead of water. Just that alone tastes SO much better than what the box says. Sorry, but I didn't have the time to make it from scratch. I'm in my senior year at LU, remember? So I headed over to Michael's for Wilton's Cake Decorating Class Course 2 - Flowers & Cake Design, with my friend Erin. The last course, where we basically just put all our flowers on the cake, was this Monday. It was fun! And that's where I learned to make all those flowers you see. And that cake is covered in fondant. Obviously, I must like fondant! But not really, it's not that yummy or edible. It just looks so good as a decoration! And as a bonus, we were the ONLY two people in the class! I guess not that many people want to learn how to decorate cakes for cheap and bypass pastry school, huh? So we basically had private lessons! Our instructor, Terry, was really nice, and even showed us how to make some flowers from the more advanced classes, courses 3 & 4. The class met Monday evenings for the whole month of February for a couple of hours. So you can say my Monday's were crazy busy, compared to what I'm used to! They went a little like this: wake up, go to 2nd grade for a half day, go home and eat lunch, go to preschool till closing, go home and quick make something (dinner plus frostings for the class if not made already), go to Michael's for the class. Which basically means that I had to make the cakes on Sunday nights, and most likely eat leftovers for Mondays. For the most part, the stud's been getting really busy at work so he's gotten home when I was at the class, so I just had to have something ready for him if need be. Anyway. Who needs a cake made and decorated soon?! I've always wanted to take a cake decorating class! How fun! It looks so cute! 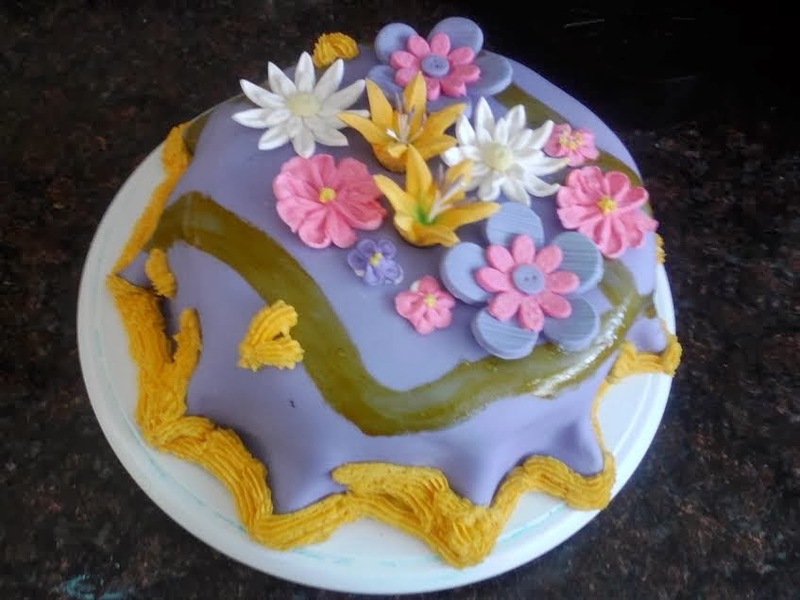 I need to get back into making cakes. So much fun! Love it! I took a Wilton class a few years ago and had so much fun! I actually need to put my skills to work this week when I make my daughter a birthday cake! I wonder how much I'll remember.